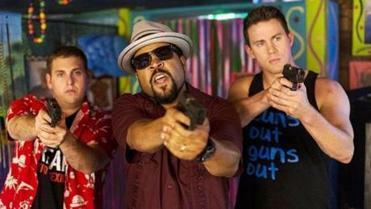 “22 Jump Street” is a hugely enjoyable shambles. It’s a comic deconstruction of that most useless of Hollywood artifacts — the blockbuster sequel — that refuses to take itself seriously on any level, which, face it, is just what we need as the summer boom-boom season shifts into high gear. When directors Phil Lord and Christopher Miller turned “21 Jump Street” into a crude but unexpectedly clever box office hit in 2012, their mockery of the original late-1980s TV show was offset by the corporate need to revive and tend to a dormant franchise. No such agenda this time: “22 Jump Street” just wants to mess around and explode the clichés of the buddy-cop bromance genre from within. The movie takes a while to lift off, but once it does, it soars on wings of pure, dopey silliness. Everyone seems to be dancing along the same anarchic wavelength: stars, directors, screenwriters Michael Bacall, Oren Uziel, and Rodney Rothman, even composer Mark Mothersbaugh, whose score wryly channels ’80s thwomp and action-movie power chords. Ice Cube has a splendid slapstick tantrum at a buffet table — the movie generously follows him into the next room and lets him rip — and the playful use of split-screen extends to a trip sequence that finds Schmidt and Jenko bumming and blissing on opposite sides of the frame. Lord and Miller approach commercial cinema not as a profit center to be leveraged but a Silly Putty canvas to stretch until it snaps. Ice Cube plays their caption. In its second half, as Schmidt the nerd and Jenko the jock find themselves splitting into separate friend groups, “22 Jump Street” brings the romantic subtext of buddy movies (a traditionally panicky subject for both characters and audiences) out of the closet and into the cleansing comic light of day. “Maybe . . . maybe we should just investigate different people,” suggests Jenko, who has found dude rapture with his football teammate and fellow half-wit Zook (Wyatt Russell). The movie doesn’t exactly ignore its female characters — a gloriously deadpan Jillian Bell goes toe-to-toe with Hill in the movie’s antic Spring Break climax — but it knows the guys have more emotional work to do. Even when “22 Jump Street” shifts to a pro forma chase scene in its final moments, the level of invention stays high, and an end-credits sequence that imagines where things might go from here is a brilliant put-down of Hollywood group think (and our own catering to it) and a miniature comedy masterpiece in its own right. This is the kind of movie that knows the manly hero has to yell something cool when he throws the grenade — I think it’s the First Law of Bruce Willis — so it might as well be “Something cool!” Lord and Miller simultaneously give us the pleasures of the text and the meta-text, and stupid has rarely seemed so smart.